Bacon and cheese is a delicious combination sent by the gods to enslave every last one of us. When I was little, I ate SO much bacon and cheese that my sweat probably smelled like those ingredients (cue the “ew”s haha). The salty crunch paired with cool, creamy cheese was just too good to pass up. However, in all my years of binge eating, what did I discover was better than that fantastic duo? An epic trio – bacon and cheese AND bread. Simply put, almost every recipe is better with carbs. One of the best things about this bread is the cheesy crust on top. Any cheese bread without a cheesy crust is a sin. I used sharp white cheddar because I like the flavor, but you could easily swap it out for yellow. 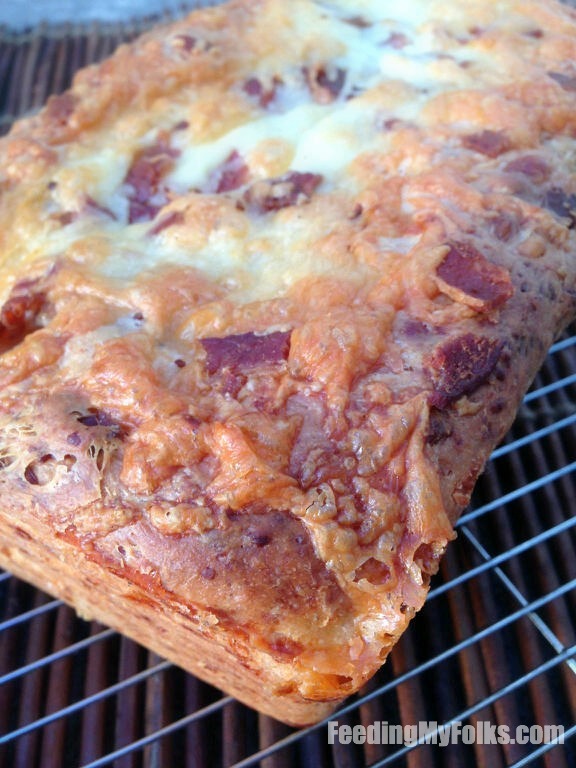 Since there is a lot of pepper and cayenne sprinkled into the dough, the bread gets a zestiness that highlights subtle flavors in the cheese while also complimenting the salty bacon. Speaking of bacon, it provides amazing smokey flavor, but also a great texture. The crumbled strips are flecked throughout the bread, giving each bite something to chew on. It makes it hearty. A slice is almost a meal in itself haha. But don’t worry, it remains super airy and light. It’s good stuff! The directions below make this bread recipe look a little daunting to make, but I swear it’s pretty easy. Just proof the yeast, add some flour, cheese, and bacon and knead for a few minutes. Let it rise, punch down, rise, add a cheesy topping, and bake. Bing. Bang. Boom. The only time consuming part of the recipe is waiting for the dough to rise….but it’s not like you have to sit and watch it double in bulk. Go do something fun, grad a drink, jump in the pool. When you’re done, it’ll be time to bake. 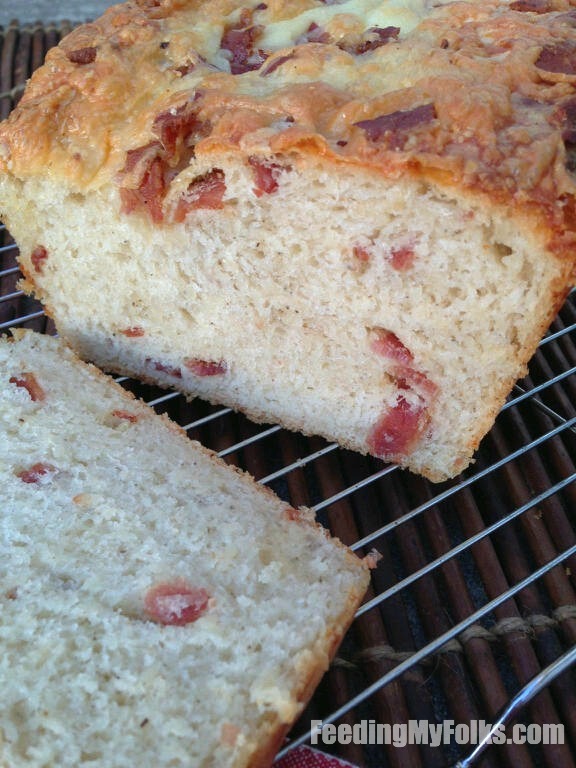 My mom and dad kept cutting off HUGE chunks of this white cheddar bacon bread, so clearly it worked for them! Enjoy. In a large skillet cook the bacon until crisp. Reserve the grease. In a large mixing bowl, combine the warm water and sugar. Stir until dissolved. Sprinkle with the yeast. Allow it to sit for 10 minutes, or until proofed (bubbly/foamy). In another bowl, sift together the flour, salt, black pepper, and cayenne (if using). Mix in 5 strips of the bacon and 2 cups of the cheese. Gradually added everything to the yeast mixture (including the 2 tablespoons of bacon fat). Knead dough on a lightly floured board for 5-10 minutes, or until smooth. Place dough in a oiled bowl. Cover with a damp towel and put in a warm spot. Let it rise until double in bulk (about an hour and a half). Transfer dough to a loaf pan. Cover and let rise until double in bulk (about an hour). Sprinkle with 1 cup cheese and the remaining bacon (crumbled). Let rest for 30 minutes. Insert into the oven and bake for 15 minutes. Lower heat to 350 degrees Fahrenheit, cover bread loosely with foil, and bake for 25 minutes. Remove foil and bake for 5 more minutes. Remove from over, cool slightly before removing from the pan. Slice and enjoy!